One of the startups I work with uses a freemium SaaS model: visitors subscribe to their service, and some of those visitors create content. Some of those content creators become paying customers when they need a premium feature or hit a capacity limit. Note that in this diagram, there’s a threshold for “engaged user.” That might be temporal (“has launched the app in the last five days”); or it might be a consumption metric (“has shared at least five files”); the point is that it’s a measurement of whether the prospect still cares about the thing you’re selling. The customer lingers in the current state, and is an asset that may convert later. For this reason, a leaky pitcher, rather than a leaky bucket, is a better analogy—because it incorporates the flow-through of a funnel; the leakage of a bucket; and the residual value of a backlog of prospects. What I was after was a leaky pitcher. I wanted a way to express not only flow through the process and leakage during the process, but also the pent-up value acquired within the system. 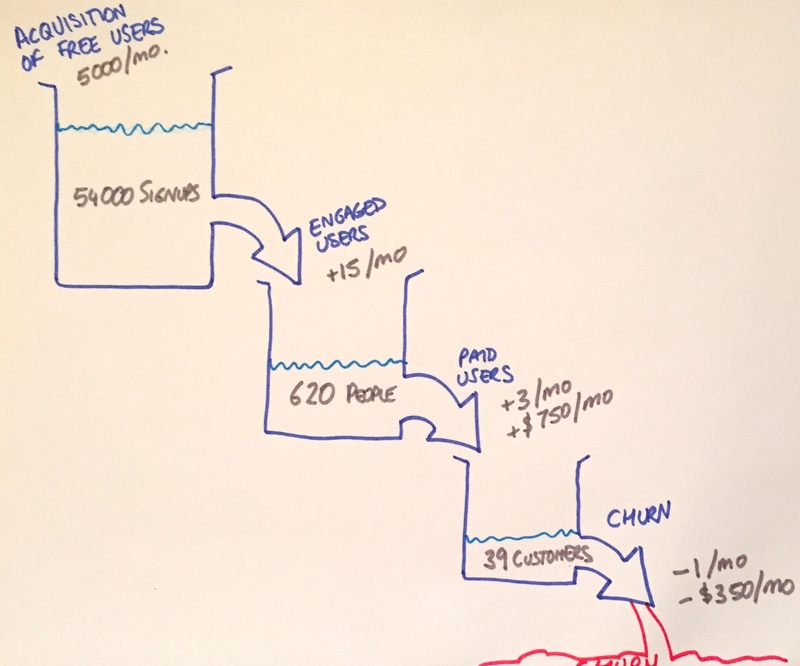 If a startup shows that free users become paying users over time—as Evernote or Dropbox do—then the amount of water in the pitchers is critical. If they’re going to create some content, ask yourself whether they really need to sign up first. If they’re going to save some files, don’t let them proceed until they’ve done so. Of course, you have to be sure you’ve chosen the right measure of engagement; if you haven’t, you probably need to rethink what, at its core, your product or service is for. You need to be sure that the behaviour you’re encouraging is a leading, causal indicator of something valuable to your business model. As a sidenote, I wrote another post recently on the dangers of the funnel metaphor in a world where there is a wide range of possible goals, and sources. 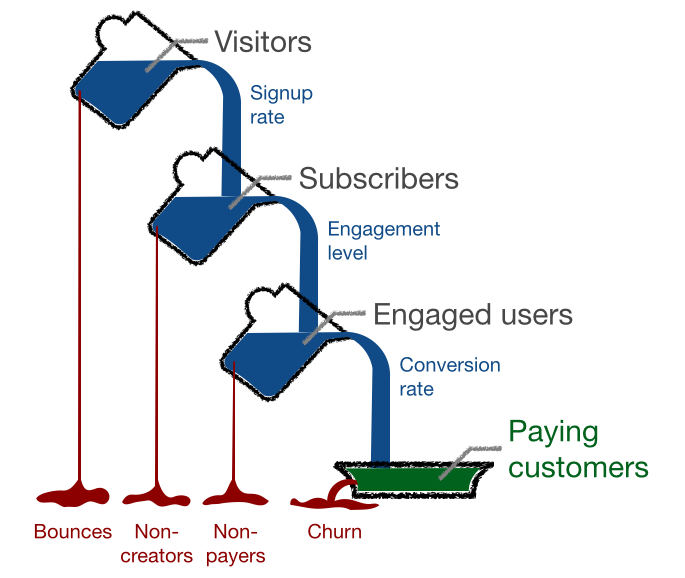 So while we’re redefining metaphors, if buckets should be pitchers then funnels should be waterslides. 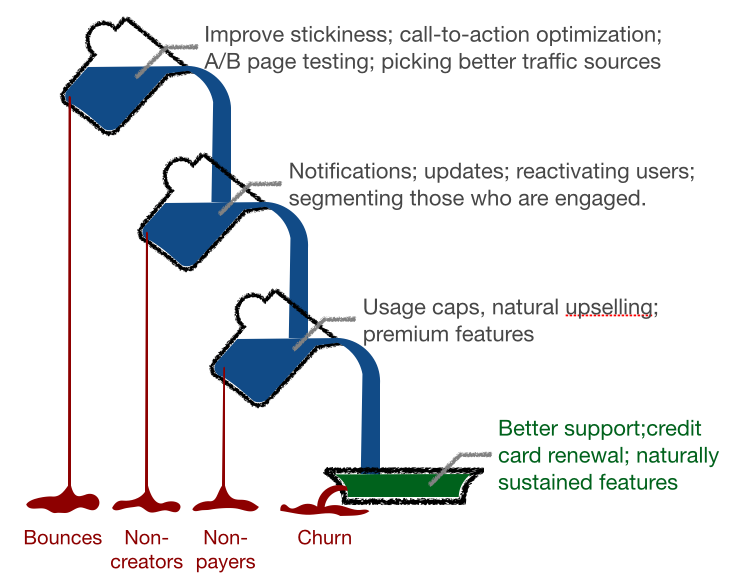 I love the metaphors of pitchers vs. buckets and waterslides vs. funnels (read that post too). What if we shift our targeting from people to jobs? Clay Christensen made this argument in his classic “Marketing Malpractice” article in HBR a few years back. Instead of focusing on demographics and psychographics, we should focus on the specific functional, emotional & social jobs people want to get done in their lives. 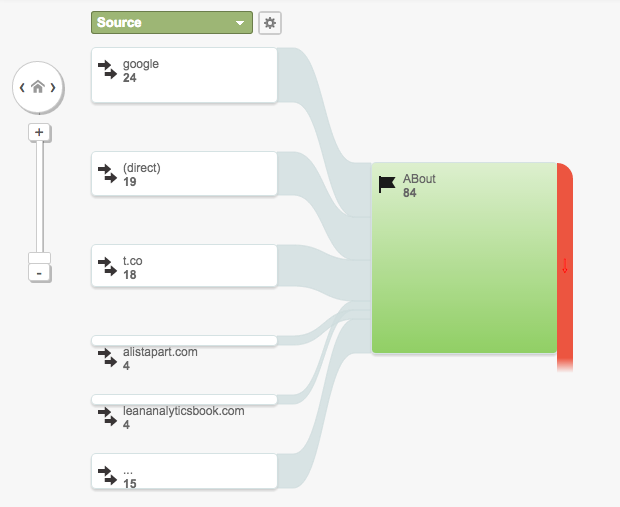 In the beer example in your funnel piece, each person is hiring a beer to do a specific job. One’s hiring a beer to do a social job. One a functional job: thirst quenching. And the third is hiring a beer to do an emotional job: self-image. There’s a serendipitous side effect I’ve discovered in practicing this shift in focus from people targets to job targets: When you focus on the job, people groups that you never would have thought about show up. Thanks so much for this great piece. Looking forward to putting it into practice in my world.